In Fantasy Football it seems like everyone one who has an opinion considers themselves an expert. Every site that hosts Fantasy Leagues services has a few "experts" who will let you know who you should start on any given week. I've played in leagues on almost every hosting site out there and the only "experts" that I've found that seem to get things right on a consistent basis are on the NFL Fantasy Football site. The best of them is is Michael Fabiano. Without having to resort to cliched one-liners or loud, boisterous predictions, he provides solid advice that everyone can use, whether your style is high risk/high reward or conservative. Rarely is his advice is off. Fabiano is a master at picking 'em. 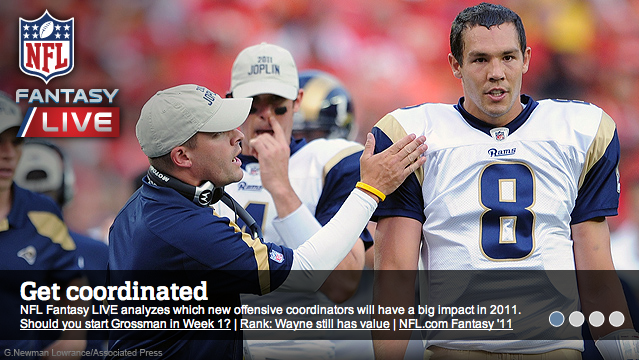 And speaking of great picks, this morning I went to the NFL Fantasy Site to adjust one of my teams and I was struck by this photo on the opening page. 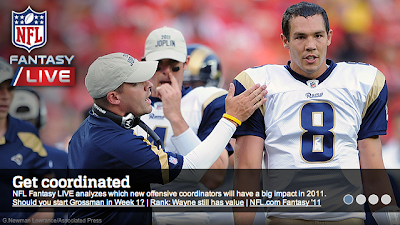 Of course that is Sam Bradford getting some sideline advice. But like the curious case of Adam Gandolfo and the Gypsy Queens, my attention is drawn over Bradford's shoulder to the teammate behind him, A. J. Feely. Talk about picking a winner! So if you are still looking for a place to play Fantasy Football this season, make sure you check out the NFL's site using this link.